Traffic signal cycle aspects differ from country to country in Europe. Germany and the United Kingdom use a "start-up yellow" interval before the beginning of a green indication. This short interval displays the yellow and red indications at the same time to let the motorist know the green phase is coming. Sweden also uses a start-up yellow before the beginning of a green indication and a "return to green during yellow" as one of the options of the LHOVRA technique. Because this is a significant difference from U.S. practice, some European practices on phase change intervals cannot be directly transferred to the United States. Traffic signals are installed on a case-by-case basis after engineering studies using a three-to-five-year analysis period. "Code of Construction Specifications for Traffic Signals"
One design approach to improve intersection safety in Sweden is to require specific geometric and operational intersection features based solely on design speed. The philosophy is to minimize conflicts (vehicle-vehicle and vehicle pedestrian) as approach speeds increase. For example, the codes dictate that signalized intersections with posted speeds of 70 kilometers per hour (about 43 miles per hour) or more must have protected left-turn lanes with protected phasing. Left turns are prohibited from roadways with speed limits in excess of 70 kilometers per hour. When high-accident locations have been identified, progressive solutions are developed on the basis of engineering studies that evaluate safety among vehicles, pedestrians, and bicyclists; mobility (delay); and traffic demand. In some cases, where accident severity is high, Sweden has removed traffic signals and replaced them with roundabouts, recognizing that overall accident rates may increase and line-of-sight may be degraded, but the rate of severe (fatal and injurious) accidents will decrease. Replacing signals with roundabouts seems to be motivated by political and police pressure. In urban areas, unsignalized roundabouts can have a negative systemwide effect because it is difficult to control and manage platooning and traffic progression. 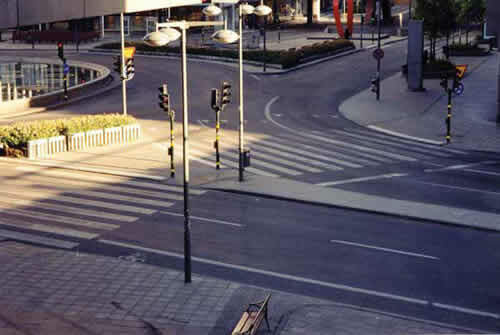 In some cases, the Swedes have installed traffic signals at roundabouts, but signalizing roundabouts is not a preferred approach and is done on a limited basis to improve pedestrian and bicyclist safety (Figure 3-1). Figure 3-1. Signalized intersection in Stockholm, Sweden. The maximum signal cycle length used in Sweden is 100 seconds. This practice is driven not by capacity, but by pedestrian and bicyclist safety. Relatively short signal cycle lengths reduce the likelihood a bicyclist or a pedestrian will cross against the red signal, particularly during the long winter months. Sweden does not allow right turns on red. This limits capacity but improves pedestrian and bicyclist safety. In general, red clearance intervals are not used because they increase delay for pedestrians and bicyclists. Most traffic signals in Sweden are treated as isolated intersections without interconnections. Master signal systems are used, but the primary focus is monitoring signal timing to make capacity adjustments. In Germany, the design and construction of signals and guidelines on their placement are found in federal standards, laws, and regulations. These guidelines (including detailed timing calculations at signalized intersections) must be followed and correctly applied, or the owning agency or responsible engineer may face criminal or civil liability. 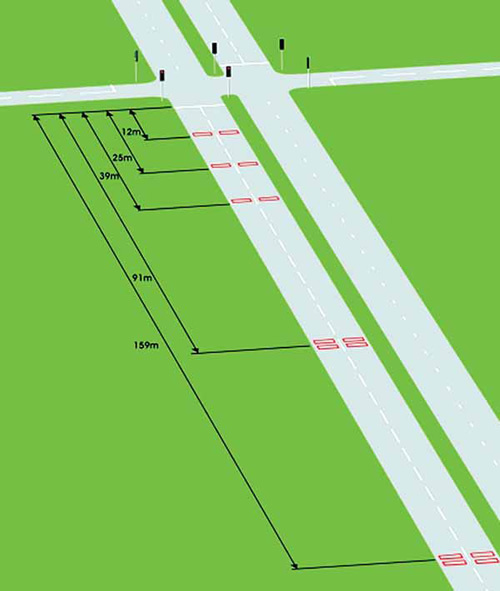 EAHV—geometric standards for intersection design These standards set rigorous clearance and signal-timing calculations that must be completed and documented for all modes of traffic at each signalized intersection. Figure 3-2. Signalized intersection layout in Frankfurt, Germany. Pedestrian-crossing indications in Germany are placed on the near side of the crossing and are supplemented by a "please wait" indication on the far side to indicate that the pedestrian button has been activated. The nearside indication is either red or green (Figure 3-3). During the red phase, the "please wait" indication on the far side of the crossing is lit. This combination of crossing signals appears to be less confusing to pedestrians than the use of far side signals with a flashing green man, and results in fewer pedestrians crossing during the red phase. Figure 3-3. Audible pedestrian signal head in Germany. Like Sweden, Germany uses shorter cycle lengths at signalized intersections primarily to accommodate heavy bicycle and pedestrian traffic. 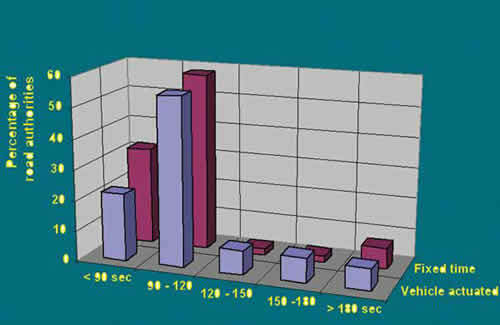 The maximum cycle length used is 120 seconds. 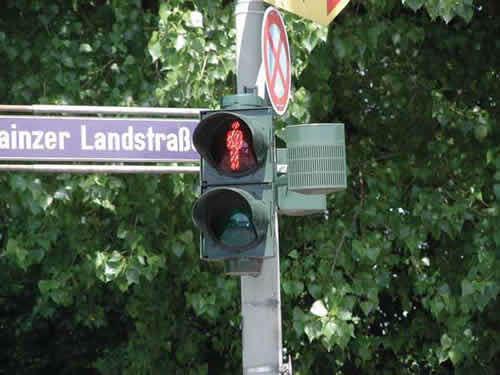 Frankfurt routinely uses 90-second cycle lengths for its coordinated traffic signals. The use of short cycle lengths is also driven by the desire to minimize wait times for pedestrians and bicyclists. 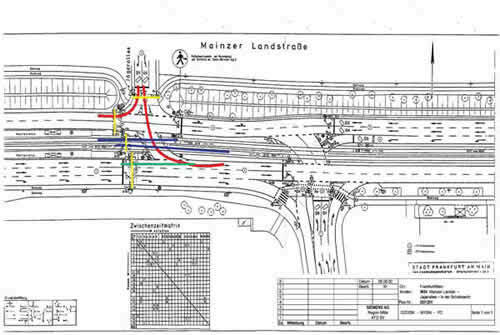 Frankfurt has successfully restricted intersection operations at a number of sites to address safety concerns and conflicts with left-turning traffic, whether they are vehicle-vehicle or pedestrian/bicycle-vehicle. In certain circumstances, Frankfurt traffic engineers have prohibited left turns and instead installed special signs directing motorists to make a series of right turns. Officials stressed that this is not a traditional treatment and that the site conditions and traffic demand must be suitable for this technique to succeed. The location of pedestrian crossings, particularly midblock crossings, can pose special safety concerns. Frankfurt uses the results of signal-timing calculations and progression analyses to identify the optimum location for midblock pedestrian crossings. Doing so helps place pedestrian crossings in locations that minimize the disruption to traffic progression and maximize the amount of green time available for pedestrians and bicyclists to cross a street. Surprisingly, the Germans believe that pedestrian crossings must be signalized if a roadway has more than two lanes to be crossed. Pedestrian crossings at intersections that cross more than two lanes must have a protected pedestrian-only phase. As in the United States, Germany has safety problems at high-speed rural intersections. To address the issue, the Germans do not place traffic signals at intersections with approach speed limits greater than 70 kilometers per hour. On facilities with higher speed limits, either the crossings are grade separated or the speed limit is lowered before intersections. Lowering the speed limit requires effective enforcement, and in many cases photo enforcement techniques have been used to successfully control approach speeds. Photo enforcement techniques are discussed in more detail in Chapter 4, which addresses innovative traffic control devices. Germany uses preemption systems for buses, trolleys, and emergency vehicles. Preemption techniques rely on several technologies, including switches in trolley rails, coil devices triggered by trams and buses, loop detectors in bus lanes, and microwave detectors and radio signals for buses. With the exception of emergency vehicles, signal preemption is considered a transit improvement, not a safety improvement. The Germans are completing a safety audit process intended for use in planning, designing, constructing, and operating signalized intersections. The audit process can be applied to existing high-accident intersections to help identify appropriate countermeasures, but the real focus of the program is addressing safety issues in the design phase. They have developed a training program and courses for professionals to become certified as road safety auditors. The program is scheduled to begin by the end of 2002. Roundabouts typically are not signalized in Germany. Signalizing roundabouts is considered a last resort and is considered only in special circumstances to improve traffic flow, accommodate special pedestrian conditions, accommodate the trolley system, etc. Motorized traffic has clear lines of sight to all bicycle or pedestrian crossings. Signals are present to control pedestrian crossings. Conflicting pedestrians do not cross more than two lanes. No bicycle traffic is present. No more than two serious accidents have occurred at the intersection in the past three years. In the Netherlands, selection, design, installation, operation, and maintenance of traffic control devices for signalized intersections are outlined in a number of publications developed under the sponsorship of CROW (Information and Technology Centre for Transport and Infrastructure). CROW is a national, independent, nonprofit partnership among the national government, provinces, local authorities, contractors, consultants, public transport companies, and research and education groups. "Handbook on Traffic Control Systems"
"Handbook on Marking and Signposting"
The ASVV includes several chapters on signalized intersections, including criteria for installing and removing signals at intersections, design processes for control systems, and design suggestions for signalized intersections. The guidelines suggest that solving traffic flow and road safety problems with traffic control systems should be considered only as a last resort and that limited reconstruction is often a better solution. The ASVV provides guidance on removing a traffic signal if traffic conditions change, making the signal undesirable by volume and time-loss criteria. Crossing against the red signal is the primary cause of serious pedestrian and bicyclist accidents at signalized intersections. The Dutch, like the Germans and Swedes, use short cycle lengths to minimize pedestrian and bicyclist wait times and decrease the likelihood of their crossing during the red phase. Sixty percent of Dutch signals use a 90-second-maximum cycle, and 90 percent are shorter than 180 seconds (Figure 3-4). When actuated signals are used, the real maximum cycle time is considerably less. Figure 3-4. Distribution of signal cycle lengths used in the Netherlands. Seventy-seven percent of the intersections in the Netherlands are vehicle actuated, and about 30 percent of all signals are operated on a coordinated network. If traffic signals are less than 400 meters apart, the goal is to coordinate their operation, a practice that, while providing safety benefits, appears to be driven more by capacity and traffic flow. The use of permitted and protected phasing is not mandated in design standards and guidelines. A survey of traffic jurisdictions, municipalities, and provinces found that about 30 percent never allow secondary conflicts (permitted phasing) between motorist and nonmotorist traffic. About 65 percent of survey respondents indicated they would allow secondary conflicts, depending on the situation. The guidelines (not mandated) are designed to provide protected phasing only for facilities with speed limits greater than 50 kilometers per hour. A limited number of traffic signals in the Netherlands are set to dwell in the allred mode when traffic is not present at an intersection. This practice means that approaching traffic sees a red signal and slows down. The practice is consistent with the overall safety practice and philosophy of reducing speed in potential conflict areas. In one instance, the Dutch installed speed detection linked with a changeable message sign that tells drivers that they must "slow down to receive the green light." If they do not, the signal holds the red light. 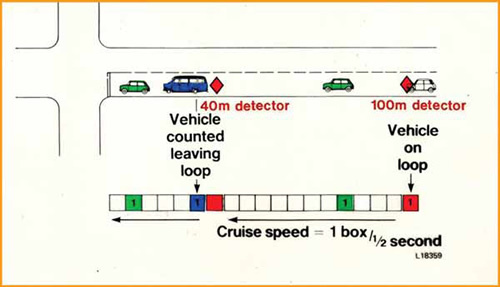 In rural areas, where allowable speeds are as high as 80 kilometers per hour, the Dutch use loop detectors before intersections to adjust signal timings with the goal of minimizing the number of times motorists are caught in the dilemma zone. This application is equivalent to some features of the LHOVRA technique used in Sweden at isolated (nonsynchronized) signals at high-speed rural intersections. 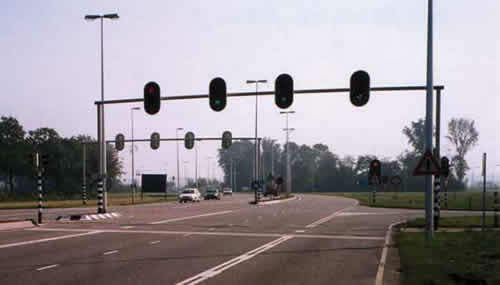 Legally, all signal heads in the Netherlands are placed before conflict points (i.e., few farside signals exist). This way, users have a better understanding of the intersection and the cross-street traffic cannot see the indication of the conflicting signal (Figure 3-5). This practice requires additional clearance times, as the stop line has to be situated farther from the intersection, but officials believe safety considerations outweigh capacity issues. This effect is minimized by the location of a bicycle lane in front of the stop line and by the clearance time needed for pedestrian and bicycle phases. Figures 3-5. Nearside signals in the Netherlands. Avoid unnecessary waiting for motorized and nonmotorized traffic. Provide adequate green times, based on speed and traffic conditions, for traffic to clear the intersection. Modify green times on the basis of traffic demands. Meeting these requirements necessitates actuated traffic control systems with an extensive network of loop detectors and powerful signal controllers capable of two-way (i.e., uploading and downloading) communication (Figure 3-6). Several four-way intersections the team visited required more than 60 loop detectors. Figure 3-6. 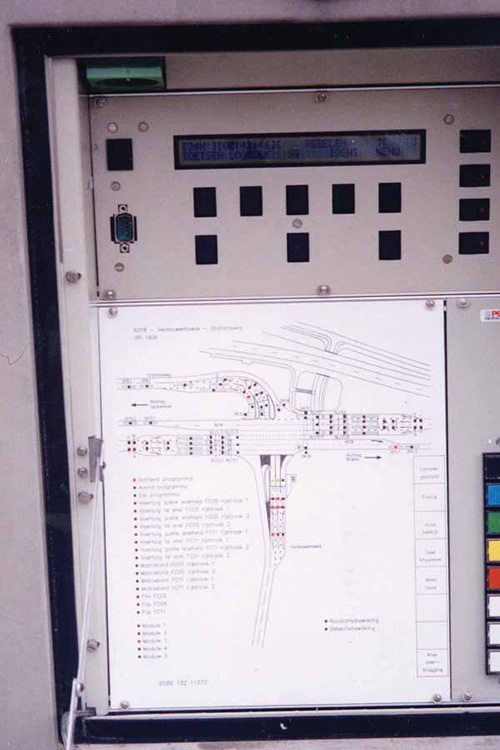 Diagram in controller cabinet at a four-leg intersection in the Netherlands. Because public transport has been a priority in the Netherlands since the early 1970s, the green phase for public transport is hastened or extended over nonprioritized control. About 50 percent of transportation authorities allow extensive priority for public transport. In only 21 percent of cases is priority to public transport not given at all. The amount of priority given is hardly related to the punctuality of the specific tram or bus. In most cases, the technique applied relies on local selective detection, like vehicle tagging, but new techniques based on radio and global positioning systems (GPS) are emerging. The U.K. 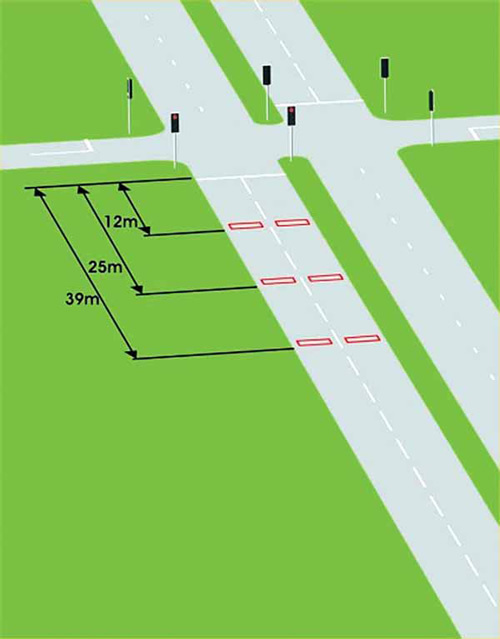 Highways Agency, under agreement with the Department of Transport, provides design guidance for signal-controlled intersections in two primary documents: "Design Standards for Signal Controlled Junctions" (document TD50/ 99) and "Layout of Large Signal Controlled Junctions" (document TD89/02). These documents outline the design principles and practices for at-grade intersections and roundabouts, including visibility requirements, lane widths, nonmotorized-user provisions, and signal equipment provisions. Most U.K. traffic signals are actuated or linked. Vehicle-actuation equipment relies on buried inductive loops or aboveground detectors, such as microwave and video. Standard vehicle-actuated signals include three loops (placed at 12, 24, and 39 meters) per approach and work well at speeds up to about 50 kilometers per hour (35 miles per hour) (Figure 3-7). Figure 3-7. Actuated signal layout for intersections with approach speeds under 35 miles per hour. At intersections with speeds above 50 kilometers per hour, special controller equipment and additional loop detectors are used to cater to drivers in the dilemma zone. Through speed discrimination and extension (SDE), special consideration is given to designing signal timing that avoids transitioning the signal when traffic is in the dilemma zone (the area in which 10 to 90 percent of drivers stop when the signal changes to amber) and minimizing red-light running, particularly at higher-speed rural locations (Figure 3-8). The goal is to measure the occupancy of the dilemma zone. If it is occupied when the side street calls, the side street is not given a green signal until the vehicles have cleared the intersection. The system times out at a maximum green time, but only if it has already failed to terminate early because the dilemma zone continues to be occupied. Figure 3-8. Layout of speed discrimination and extension configuration for speeds over 45 miles per hour. Amber time in the United Kingdom is three seconds plus or minus a quarter of a second. Research studies indicate that increasing the amber time would increase the number of accidents. Similar research looked at providing a warning that the green phase is ending (green indicator flash for two seconds before yellow). This practice also was found to have a negative impact on intersection safety. Linked traffic systems in the United Kingdom typically rely on the TRANSYT signal coordination computer program to coordinate the system. The split-cycle offset optimization technique (SCOOT) program was recently introduced and is a method of using on-street information provided by loop detectors to automatically update offsets and splits based on current traffic conditions. Forty percent of London's signals are controlled by SCOOT, and changes to timing plans can be made from a control center.7 The use of the various linked signal system packages is driven primarily by capacity and delay considerations, and not much research has been done to determine measurable safety results. Holds the green for traffic flowing at saturation rate. Detects accurately the end of saturation flow. Decides after saturation flow ends whether to end or continue green. Makes maximum green times no longer critical. Detects oversaturation lane by lane. Switches to capacity-maximizing control when overloaded. Figure 3-9. Microprocessor optimized vehicle actuation (MOVA) traffic model. Implementation of MOVA technology has resulted in substantial delay savings, depending on site and traffic conditions, and this remains the case with more than 500 MOVA-controlled intersections in the United Kingdom. Initially, MOVA was shown to improve intersection safety by reducing incidents of red-light running at high-speed sites by 50,000 per year and reducing injury accidents at four highspeed sites by 30 percent. Later results have not been as favorable, with safety remaining unchanged at 31 high-speed sites recently studied.8 Further research into MOVA safety results is under way. Figure 3-10. 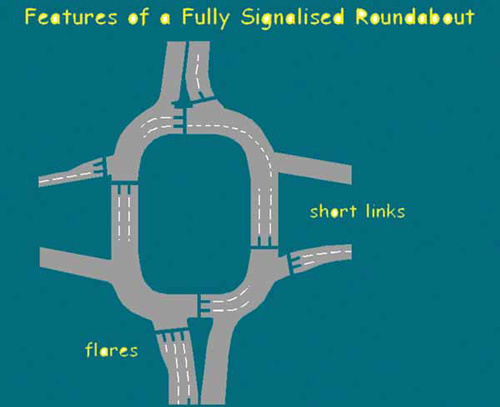 Features of a fully signalized roundabout in the United Kingdom.